Originally constructed in the early 1900s, the house reflects a Greek Revival style of architecture. 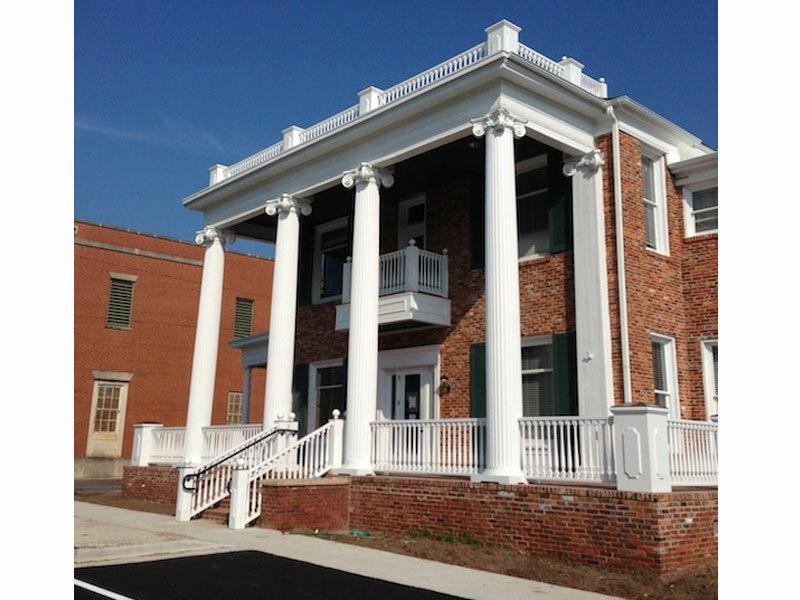 Typical characteristics of this style and era were prevalent including white paint, bold columns, and heavy cornice detailing. The porch railings and balustrades were made of handcrafted wood and added beautiful detailing to the home. The layout was revised to accommodate the new home for Community Bank, so many interior walls were demolished and rebuilt. The funeral home parlor area was transformed into administrative space for bank officials and the mortuary was converted into storage and break room space. When historic elements of the original construction could be saved or replicated, they were. For example, much of the original wood flooring was restored on the first floor of the building and interior plaster was historically restored by professionals. The balustrades on the front porch at all levels were installed to resemble the original construction of the house in the early 1900s. Many of the window units in the house are the original units. If windows had to be replaced, they were replaced to match the original wood windows.